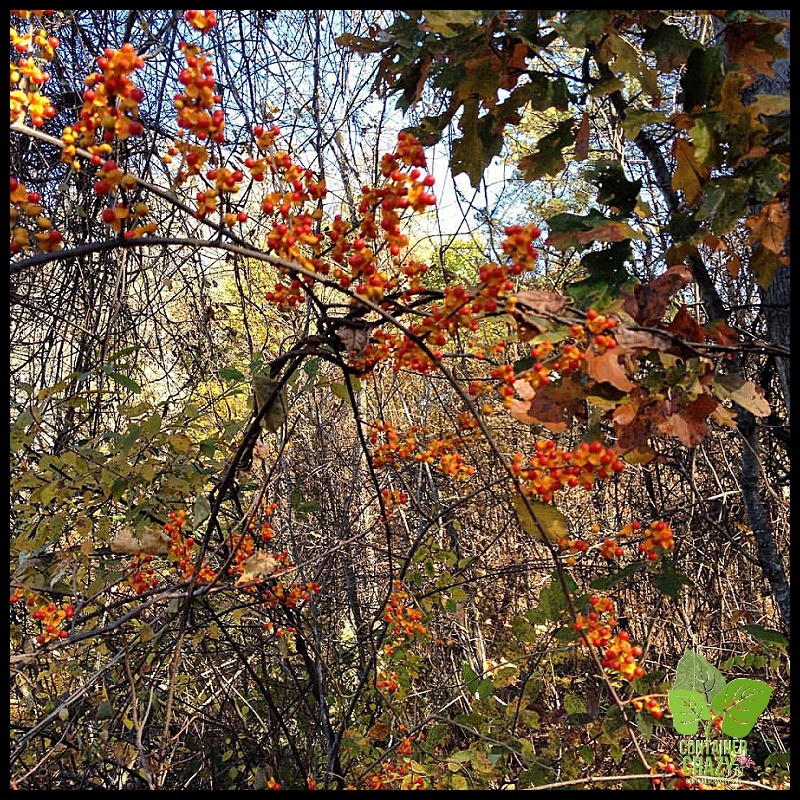 We often don’t consider the impact of grabbing something from the woods to add to our Autumn decor this time of year, so if you weren’t aware of the potential spreading of this highly invasive plant, beware of bittersweet. I spotted bittersweet twined around some branches in the woodlands by my home, and took a quick photo yesterday. It is not difficult to spot. The yellow and orange coloring stands out in the landscape especially as other trees begin to loose their leaves. Asian bittersweet, also known as Oriental bittersweet (Celastrus orbiculatus), is a non-native plant, invasive and listed on Connecticut’s Invasive Plants list. Bittersweet climbs by twining around trunks of trees and other branches. It can strangle its host over time. While the colorful berries are easy to spot, the leaves may have fallen from the plant by the time you spot the berries in Autumn, which is the case at my home – Thus, distinguishing this species from the American bittersweet (Celastrus scandens also used in fall decor) may be challenging. American bittersweet is said to not be as much as a problem, but it can quickly grow to 20-30 feet long or more, so you decide. Both types can and will usually attach to another plant or structure. Oriental or Asian bittersweet leaves are variable in shape (egg-shaped, oblong, round, tapered, etc) so distinguishing it from American bittersweet may be a little confusing upon a quick glance if you get tempted to take some for your decorations, but I would suggest using caution either way. Oriental bittersweet plant grows well in shade so you will find it embedded in woodland areas or around branches of native shrubs. Its one of those plants that will find a way to continue growing even when you tear it out by its shallow roots because every little piece left in the soil or torn pieces will grow more shoots. Birds also carry the seeds to other locations. When the fruit on this plant splits open, you see the yellow parts on the outer parts which reveal the seeds in the center covered in orange fleshy coatings. This is nature’s way of moving it around, but humans may unknowingly move it to their yard too when they attach it to grapevine wreaths to put on the doors in the fall, or take it inside to put on the table as a centerpiece coloring. After all, it can be found for free in the wild because it is invasive and usually easily spotted. If you decide to use it in the home, be sure to dispose of it in the trash and not in your compost. That’s a long story – which you may read about here: Untangling the Twisted Tale of Oriental Bittersweet by Peter Del Tredici. You may wonder how it gets to your yard – and one way is by not knowing it can spread in the pieces you take away from the woodlands. This is one of the cases where using fake plants is better. Thanks for sharing the warning. Yesterday I was in the country in Maine and I cut branches in the wild from bushes with orange berries. However, there was no yellow along with the orange, which is the identification I use for oriental bittersweet. I’m in a quandary now. So far I have the branches with berries in plastic in trunk of my car. I will send you a photo tomorrow. Don’t some nurseries now sell holly type shrubs that have a rather orange color berry, in addition to selling the usual red berry types? Please let me know what you think I have. Note that the stems were straight, not twisting, and shrubs were 3 to maybe 7 feet tall. Thank you!